75% of the Bible is narrative. Not only does it tell a story, the story purports to take place in real places under actual world leaders and political systems. That’s why there are maps in the back. This fact sets the Bible apart from other revered texts. For instance, the Koran is a series of moral and theological maxims without a narrative component. While the Book of Mormon tells a narrative but the actual places and civilizations cannot be identified in any way. That’s why there are no maps at the back. The Bible is more than myth and more than wisdom literature. As a book of historical theology, it stands unmovable above mankind’s manipulation. God has revealed himself in our past because, like God, the past is not subject to change. God has revealed himself in the same way we get to truly know any person, by what he has done. His actions in the past give us assurance about what we can expect from him in the present and the future. In our culture, we’ve both diminished and exalted the power of story. When it comes to the story of God, we have relegated those sections of scripture largely to children. In doing so, we’ve turned the record of God’s mighty acts into a bunch of morality plays akin to Aesop’s fables. No wonder our young people leave the faith in college! The metamessage of our approach says to them, “These are cute stories for children but adults don’t really take them to heart. They’re probably not true.” Conversely, and ironically, we have elevated fictional storytelling to a high art. Adults read youth novels. Youth novels become blockbuster movies. Blockbuster movies along with other stories told by the professionals in Hollywood consume our time, money and attention leaving us intellectually, morally and spiritually bankrupt. As the sole credible tellers of stories, the folks in Hollywood hold firmly to the helm of our culture. Hollywood wields such power because our species has always depended upon story to propagate and preserve truth. Unfortunately, the skill of storytelling has been lost to the patriarchs and matriarchs of our day and age. To help us reclaim the art, I’ve created the graphic below. 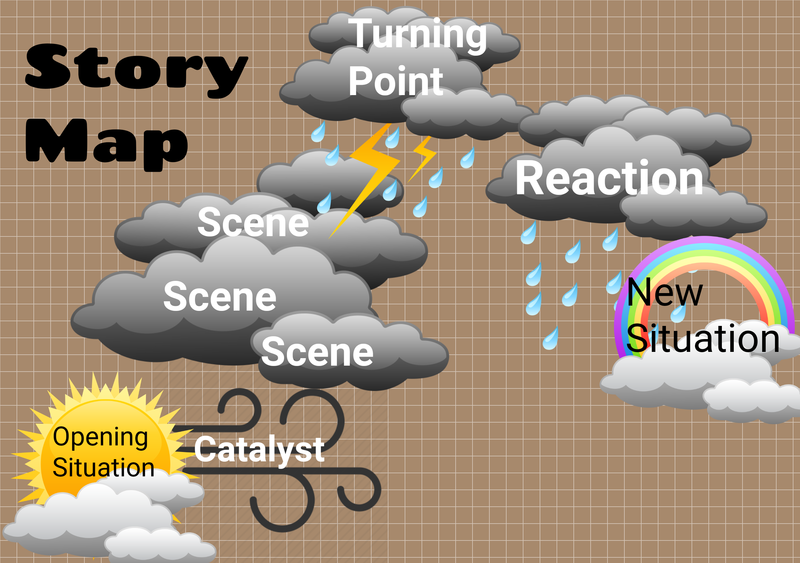 As we’ve been learning to tell God’s story, we’re discovering that using this story arc has given shape and appeal to the stories we are crafting. I’ll post more on this topic in a few days. In the mean time, take a Bible story and consider how you might divide into each of these six elements. Let me give you a for instance from the Adam and Eve story from Genesis 2 to give your brain a jump start. Opening Situation: A man lived alone in a garden planted especially for him. Catalyst: God saw that it was not good for the man to be alone. Scenes: Out of the dust of the earth, God formed all kinds of animals and brought them to Adam to see what he would name each one. But for Adam, no suitable companion was found. Turning Point: God caused the man to fall into a deep sleep and took a rib from his side. With the rib, God formed a companion for the man and brought her to him. New Situation: For this reason, a man shall leave his father and mother and be joined to his wife and the two shall be one flesh. The man and his wife were both naked and they were not ashamed. Where the Buck Stops, So Does the Gospel.